Alright y’all. It’s been a week since my last post – it turns out having a time-consuming job is, well, time consuming. In addition, I went to High Table at Christ College (because I’m fancy) and had a lovely meal with a collection of Brits who are a parody of themselves. I watched England beat Sweden in the Euro 2012 match at the Champion of the Thames (that’s a pub)(with one of my favorite signs). I spent an afternoon in Hunstanton, a Victorian seaside resort town in Norfolk (I would love to go back when its actually warm and sunny). Since I haven’t really had time to process all the fun things I’ve done recently, I’m sharing some photos of Cambridge from my explorations of the colleges earlier in the year. The red brick building is from Newnham College, an all-women’s college founded in the 19th century. The chapel image is from I don’t remember where. 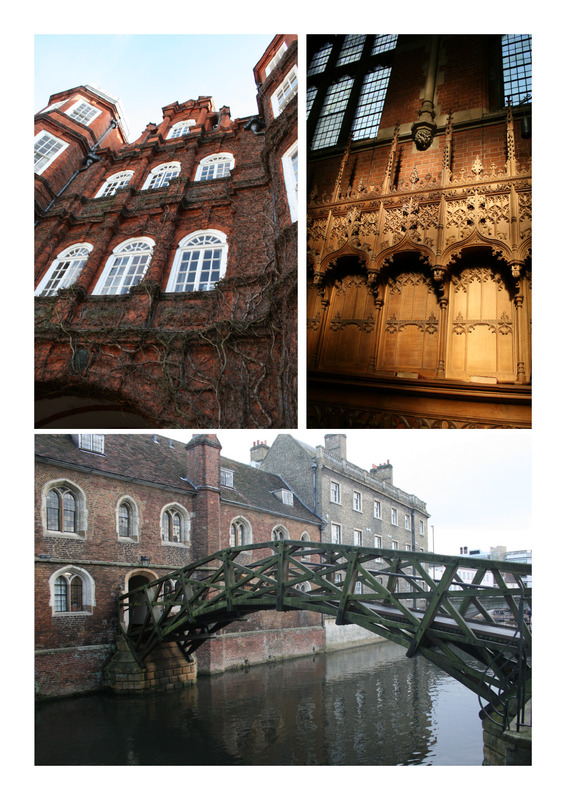 And the bridge at the bottom is a Cambridge landmark, the Mathematical Bridge, which is part of Queen’s College, Cambridge. Cambridge really is breathtakingly cute.